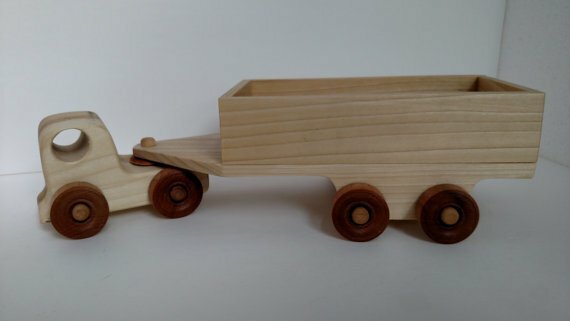 Wooden truck and trailer, made without nails, screws or staples. The unit is finished with non toxic mineral oil and is built with Poplar wood from local sawmill in Chichester, NH. It measures 12" Long x 4.5" Wide x 3.0 H.
"I have always enjoyed working with wood. I have remodeled several houses that we have lived in including the construction of a 20' x 30' barn. 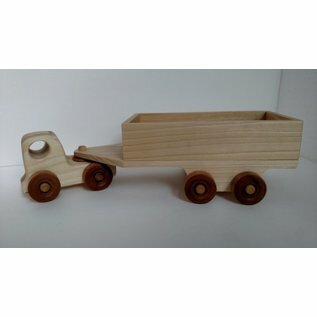 I started building wooden toys while living in Arizona. I donated them to Phoenix Children's Hospital and Cardon Children's Medical Center in Mesa Arizona. I build approximately 150 toys before returning to New Hampshire. Once I returned to NH, I setup shop in Chester, NH and donating toys to the Boston Children's Hospital. At the same time I decided to sell them."